How do I make sure my investment property is managed properly? You’ve bought a great investment property and are on your way to a brighter financial future. But as a property investor you have responsibilities to your tenants and a physical asset to protect. Are you sure you can trust that your agent has the experience to protect your investment? Don’t let inexperienced Property Managers or unreliable tenants undermine your rental returns. Aim to keep your property occupied using quality marketing strategies. Give you confidence to choose tenants with comprehensive reference checks of all applicants. Keep you up-to-date on the condition of your property with detailed reports and photographs after regular inspections. Maximise your rental returns, with expert pricing recommendations and annual rent reviews. Save you time, money and stress by dealing with difficult tenant and property management situations for you. Make tax-time simple with professionally kept records of all expenses arising from property management. Protect you from time consuming and expensive disputes with our extensive knowledge of the Residential Tenancies Act 1997. Experience does count! With us overseeing your investment you can rest easy with ongoing personalised service and regular communication. Talk to our expert team today. How long it will take to lease my property? This will vary depending on a variety of factors, and varies throughout the year. The current market is the most influential factor and we are able to provide a current average days on market figure at any point which we can discuss with you if your tenants decide to vacate. There many other factors in determining how long a property will take to lease including:- the condition of the property, current market conditions, how many comparable properties are on the market at that one time, the quality of the photos for advertising and most importantly the rental amount. We work to maximise your rental and reduce vacancy rates and discuss our leasing strategy to achieve your goals. How is the rental value determined, and why does it fluctuate? The current market dictates the rental value and a variety of factors will influence this as well. Basic rules of supply and demand mean that rental values will fluctuate and this means that rents can increase as well as decrease. Just because the sales prices and sales market are increasing, does not mean the same is true for rentals as the sales and rental markets are independent of each other. When evaluating a rental price we conduct thorough research and look at the current market, comparable properties that are currently for lease and recently leased. Do I have to attend to maintenance? The simple answer to this question is yes. If a tenant reports a maintenance item, the Residential Tenancies Act dictates that we have 14 days to attend to the issue for non-urgent repairs. Urgent repairs must be actioned immediately. When maintenance is reported, we will always discuss the repairs with you and decide the best way to proceed. By ensuring maintenance is done in a timely manner, a healthy relationship with the tenant is maintained and your property, which is a major investment, is keep in good condition. Should I sell or re-lease? We can assist with providing you a current property valuation through our Vendor Advocacy service to help you make an informed decision about the best options for you and your investment strategy. Having moved interstate from Melbourne, it was important to find a property manager who I could trust to look after my two bedroom rental property in St. Kilda. 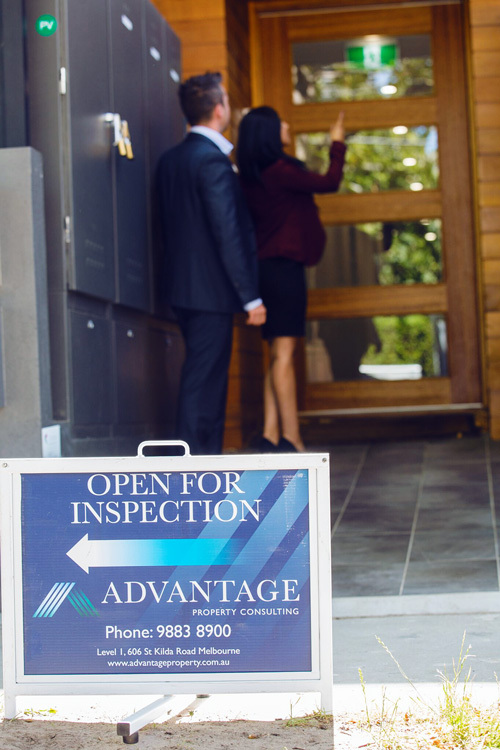 Frank and Michelle Valentic, Brant Williams and the whole team at Advantage Property Consulting proved themselves to be very reliable and proactive with my property. They helped me find the right long-term tenants, give me realistic advice on market rental returns, give me multiple estimates from tradepeople to do repairs, and were able to gain my trust and run my property for me. As Buyer’s agents we understand how important reliable tenants and rental returns are to your investment success. Talk to us today. Book a free consultation to discuss our property management services today.